A River Walk to Remember! 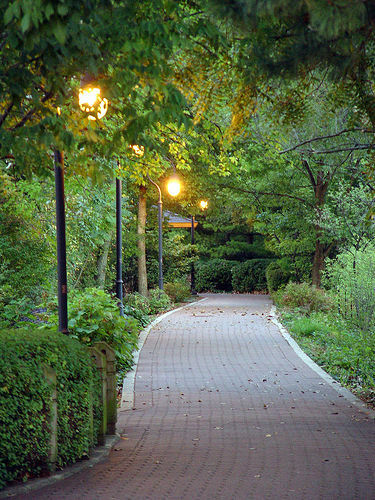 The Naperville Riverwalk consists of five miles of winding brick paths that meander along the banks of the DuPage River in downtown Naperville. The brick paths are not the only thing this beautiful place has to offer! 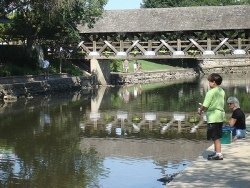 Charming covered bridges, fanciful fountains, and lush landscape entice visitors to slow down and soak in its splendor. Naperville residents built the Riverwalk in 1981 to celebrate the town's 150th anniversary. The residents generously donated their time, talents, and treasures to transform the DuPage riverfront into one of the most spectacular parks in the Midwest. The Naperville Park District meticulously maintains the Riverwalk throughout the year.